Its called social for a reason — because interaction is part of what makes it different from broadcast media. And, that interaction with brands ought to be based on hearing what others say — not just the cranky ones or the customer support issues, but the happy and proud brand advocates. Mack Collier has lots to say about that as he has been championing turning customers into fans for a while now. In broadcast and traditional media we did not interact; we watched listened and read or viewed what brands pushed our way. There was no interaction or any real way for the brand to know whether I liked them or even used their product. Social implies, in my mind, some kind of to and fro, a conversati0n — i know thats a little old school. But here is an example. And, I dont normally single folks out like this, but seems to me this points to how far we have to go to really make social resonate and achieve all it can for communications, marketing or what companies “talk” about– their relationships with customers. 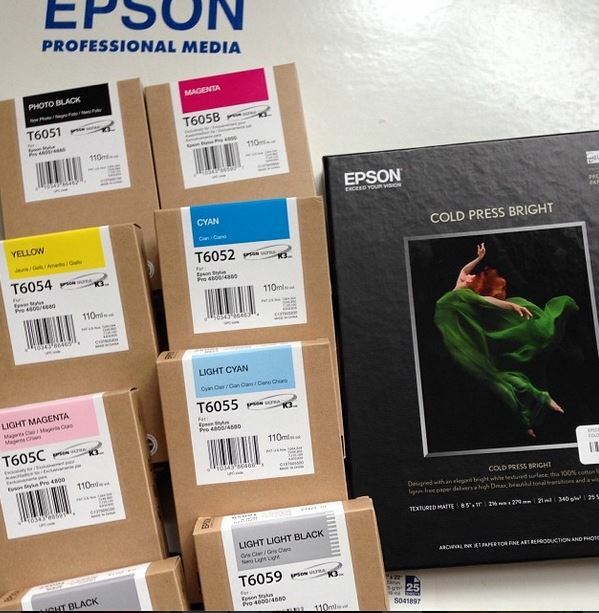 On February 1st, I dropped about $700 on Epson inks and photo paper for my epson digital printer. I bought it at the local retailer, Precision Camera, where I am like a kid in the candy store. I always have a great experience with the staff there. What followed was I bragged about the quality products from a manufacturer. I tweeted it, Instagramed it and shared on Facebook. Epson inks and papers help me generate beautiful photo prints that are frameable and archival to pretty much the same degree as traditional photographs. Properly protected with UV glass in a frame, etc, a digital photo has the potential to live nearly 200 years, the same as a print done in the dark room. So the inks are not cheap nor is the paper, but it allows me to give “real” photo prints to others that want to frame a photograph, and share a vision of beauty — all thanks to a) the Nikon camera and lens I shoot with b) Adobe Lightroom for processing c) and, Epson’s printer and high quality photo paper and inks to make that final print. Together they help me realize my vision and success with a craft….and when I print those archival “art prints” I’m a pretty happy guy when I get the print to where I want it to be. Surely, the very basic act of listening can lead to some very simple engagement by business with customers that make customers feel valuable. Think of it this way — a simple “thanks” could actually reinforce brand loyalty and our relationship — right now, I feel like its all about the transaction. Maybe its time to look at other photo papers? I get that I am no pro-photographer spending thousands with Epson every week…on the other hand, the purchase was hardly a box of Kleenex either. And, by the way, it also occurs to me that even though I am using a personal example here — I see and hear this all the time, so the question really is at a more general level: Are your social efforts attuned to connect with your customers and build relationships and “social connections” or has listening and engaging with customers fallen to wayside as you chase the latest in social marketing and advertising? That may have little to do with all your customers and other business stakeholders who engage in social media…. Reward the type of behavior you want to encourage. That’s all you have to do, it would have taken Epson 5 seconds to tweet a thank you, but their SM team obviously hasn’t been trained to do that. If I ever see anyone posting anything positive about my book, I immediately thank them, which often leads to them PROMOTING THE BOOK TO OTHER PEOPLE. Which means I am thanking more people, and so it goes. As you said it’s social. If someone pays you a compliment, you say ‘thank you’. It’s not about using social media effectively, it’s about having good manners.